I did it. I focused, after taking my husband to the airport so he could teach pastors in training in the Ukraine, and I buckled down and really worked! I made both of those pocket memory tops from my dad's shirts. I had just recently found them and knew I wanted to go ahead and make these up. Since they are going to be memory quilts for someone in our family, I just made them simple. I sashed the 8.5" pockets that were already cut, put a square in a cornerstone and finished them! I made one in red and one with off white sashing. I thought the contrast could be interesting. Plus, I tried to divvy up the shirts so they sort of went with the sashing color. For example, in the off white sashing are some blocks that actually look red. They aren't. They are sort of a burnt orange. I didn't think they'd show up very well with the red sashing. I followed the biblical example of not putting "new wine in old wineskins" (Matthew 9:17) so I used second hand sheets for the sashing, so that I wasn't mixing older and new fabrics. Well, OK, a few of the cornerstones are new fabric I bought to mix in with the other fabrics on the first few quilts - a piece of wheat fabric and a couple squares of bandanna fabric. But for the sashing itself -they are straight from my to-be-upcycled shelves of sheets/duvet covers, etc.. In case you are wondering why those pockets aren't always centered..., it's because it's the way the shirts were made. On some shirts the pockets were placed far enough from the curved sleeve seam, so that I could cut a 8.5" square pretty easily, centering the pockets. On others, I couldn't. There seemed to be no "normal" here. Anyway, they are simple, but the tops are done. 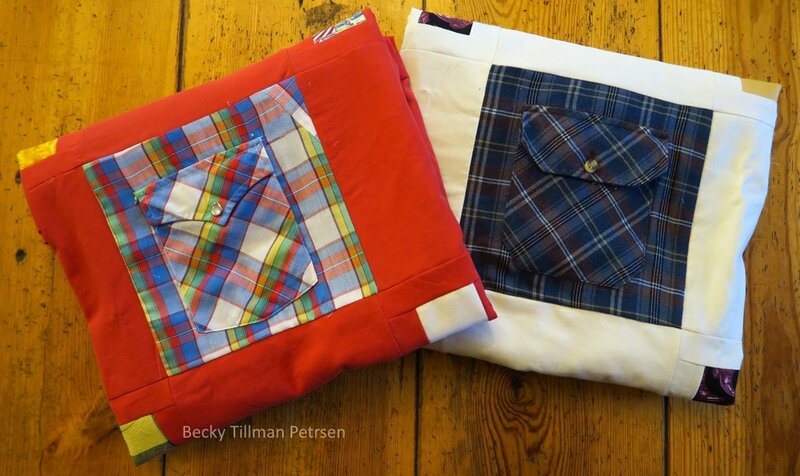 I'm happy that these pockets from my dad's shirts are that much closer to becoming quilts. The blocks are cut 8.5". The sashings are cut 4.5"x8.5". The cornerstones start at 2.5" and I centered them in a 4.5"x4.5" block so I needed 1.5"x2.5" strips for the side of the 2.5" square and 1.5"x4.5" strips for the top and bottom of that center piece. That's it. Here's the layout if you are interested. I may or may not someday write up the pattern. And that's one of the things I've been busy with today. I feel like there aren't nearly enough hours in the day to do what all I want to do! You can see on the upper right corner of the left shirt's pocket where I had to add a section of fabric in order to make it a full 8.5" wide. I didn't even try to match the plaids as I was working with leftovers and didn't have enough fabric to do that. 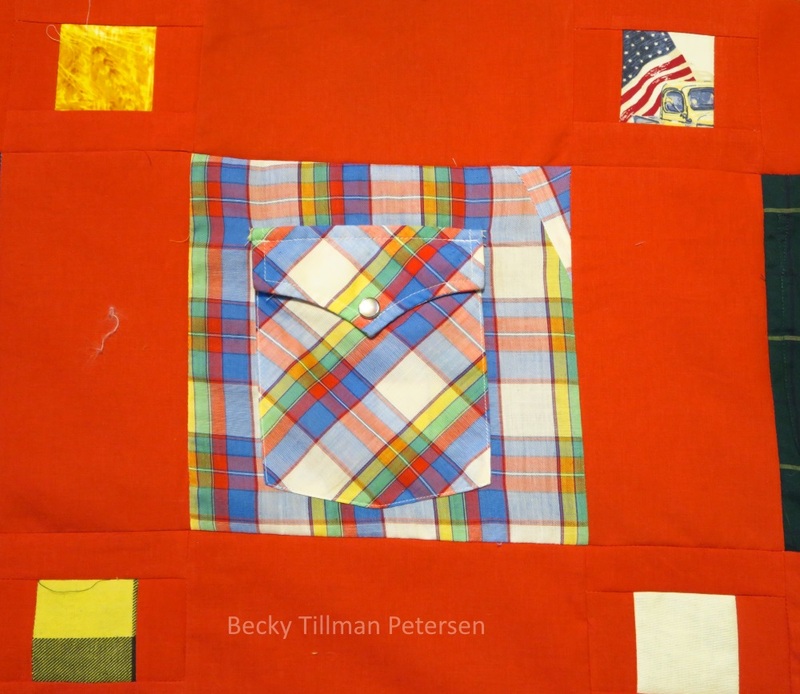 So, I just "gloried in the diversity" and sewed a piece on - not worrying about matching plaids or even directions of the print. I had to do it several times on several pockets for these two tops. If you need something for your current projects, be sure to look around the site for the goodies my sis has for you!